The incense smoke clears, and the sparks die down. You crawl out from your hiding spot behind the blood stone tablet thinking this stupid argument is over. But then you turn right back around and start putting some wards up, because these spiteful witches brought out the Hexen Stix. It’s gonna get messy. This is part two of our review for Curt Covert’s round table card game: Hex-Hex XL. If you haven’t read the first part then you probably should. This review specifically deals with the in-box expansions: Hexen Stix and Hex-Hex Vexed. Yeah, they did that on purpose. They love their puns. Okay, so by the time you even unwrap these cards you’ll want to have played several rounds of the original recipe because I would qualify these add-ons as the “spicy chipotle” and “extra crispy” version of Hex-Hex. They are a lot of fun, but they definitely aren’t for everyone, especially beginners. 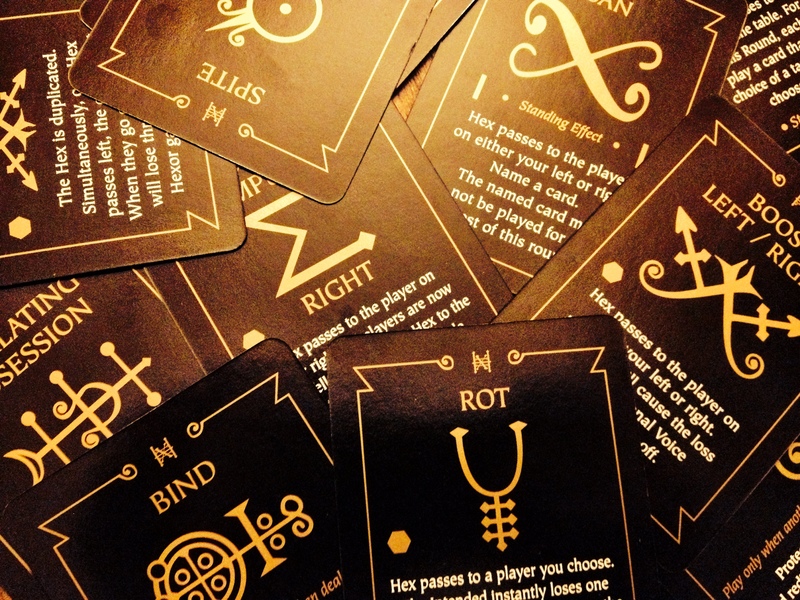 So let’s kick this review off with the first expansion: Hex-Hex Vexed. 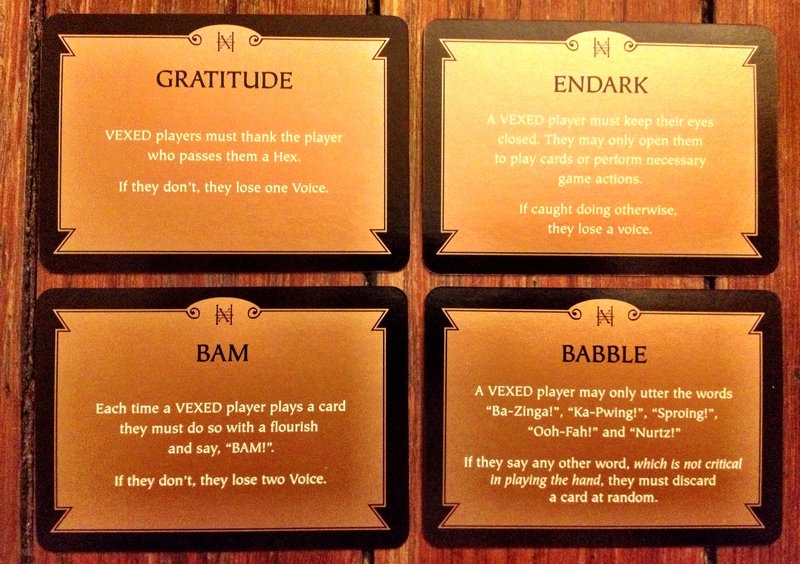 Vexed takes the extra rules that you add on in the original game and makes them more challenging by turning them into a deck of rules that changes every round. Anyone hit by a hex must obey the temporary rules for the next round or face severe penalties, and these rules are way more creatively evil than anything your friends ever cooked up. 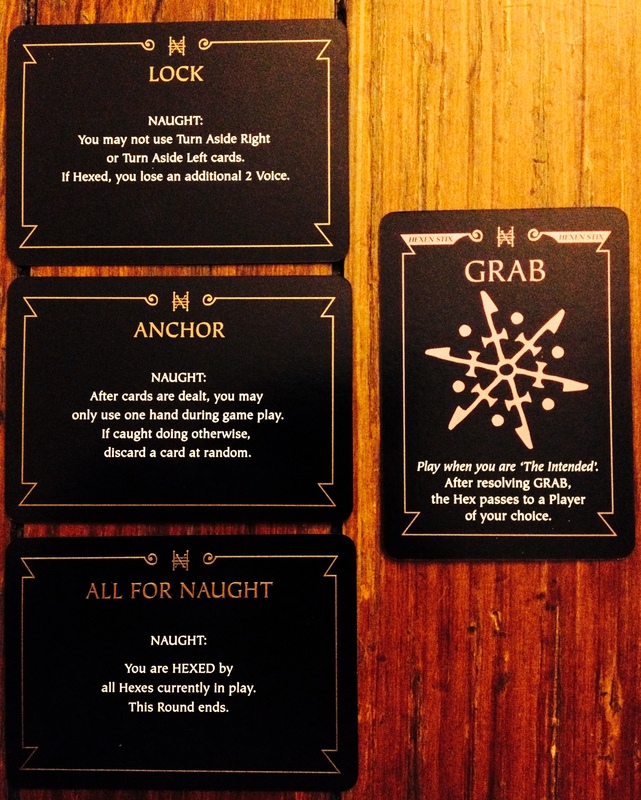 Not only does this make Hex-Hex more of a party game, but it also adds something to the imaginary story of the game. The way the hexes move around the table combined with the naming of the cards like “Knock Aside Right” and “Duck” gives this game a really strong visual sense. It’s easy to picture how this magic duel looks based on how the game flows. By making specific punishments follow specific hexes, the designers have successfully filled out the only missing piece: what these spells actually do! With the expansion you get the full experience of being in a wizard duel, complete with amusing and embarrassing side effects. 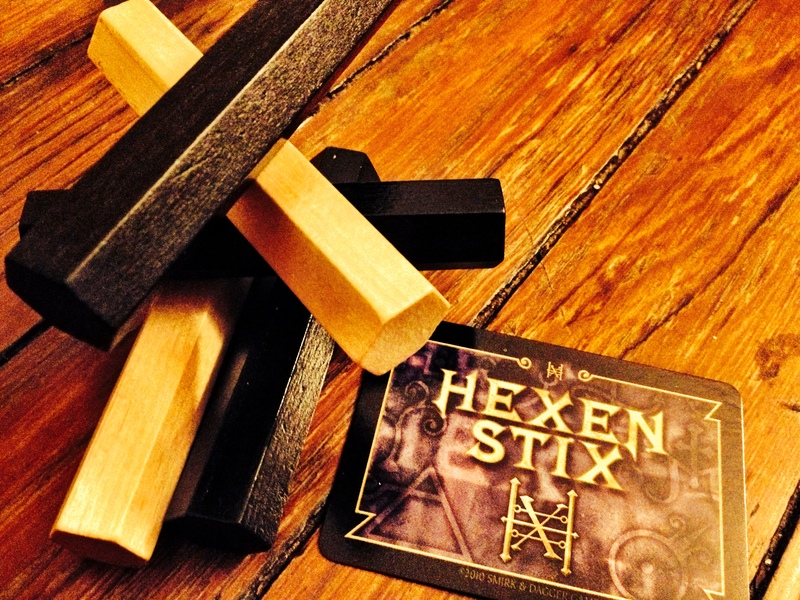 Where Vexed expands on one minor aspect of Hex-Hex, Hexen Stix picks up another. By and large the original game doesn’t really require a lot of dexterity. It’s fast-paced, but there’s no penalty if a player takes a moment to think, other players just have to wait to continue. The one exception is the Hex-Hex card, which requires players to drop their cards, cross their hands above their heads and say “Hex-Hex!” before everyone else. It’s a fun little element, but it’s really a bit out of place with the rest of the game. Hexen Stix aims to fix that by introducing Grab cards. When playing with this variant, players place a stack of hexagonal rods in a circle at the center of the table. There are always one fewer rods than there are players. When a Grab card is played, everyone tries to get their hands on a stick and whoever fails gets a penalty. Players with sticks may get rewards based on whether they grabbed a bone (white) or an ebon (black) hexen stick. These effects are randomly drawn from the Hexen Stix deck and range from harmless to life ruining. The addition of this simple system adds a huge level of danger to the game. One or two slow grabs can drop you from winning to losing and makes everyone twitch with every card that’s played. This variant is great if you want to be on the edge of your seat and really livens up the game if you’ve been playing for several rounds but you aren’t quite ready to quit yet. In a similar way to Vexed, the Hexen Stix really illustrate the atmosphere of the battle. In a very Matrix-like way, the sticks help you imagine split second reactions that mark the difference between victory and defeat. As you’re reaching for the last stick you can almost see your character dodging for cover as a giant fireball goes off overhead! All-in-all, these are really solid expansions to the game that add not only fresh game play but also further flesh out the story. Were they sold separately, I would be recommending that you go out and buy them because they are really that good. Fortunately, they are built straight into the box, making Hex-Hex XL a really good deal. The variants are distinctly different games; Vexed becomes more of a silly party game where Hexen Sticks emphasizes focus and quick reflexes, while the original plays more like a cautious strategy game. Although they all share the same core elements, each version feels very different and is appropriate for different environments, so it’s really like you’re getting three games in one. Highly recommended! This Post was posted in Card Game Reviews, Concurrent Action Game, Dexterity Games, Family Game, Humor Games, Party Game and tagged card game review, Card Games, comedy, Curt Covert, Hex-Hex XL, Magic, puns, review, Skip-A-Turn, skipaturn, Smirk and Dagger Games, story games. Bookmark the permalink.